When you see Personal Shopper, go in knowing as little as possible. Its not that there are twists, there really aren’t any, rather it’s that the film isn’t classifiable. Its most certainly a drama, but it brings in things which would, in the hands of a typical studio, would have defined the film. If you want to see a unique and very good film and don’t care what type of film it is stop reading now and go buy a ticket and go see it. If you need to know why just know it’s one of the more enjoyable films from this year’s New York Film Festival. If you want to know more keep reading. 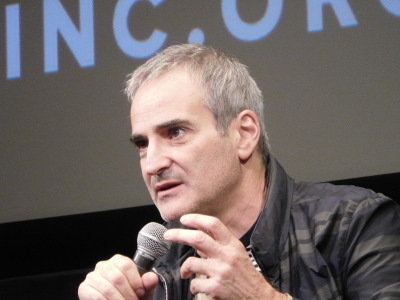 At the press conference for Personal Shopper director Olivier Assayas said that he doesn’t need to sell his films to anyone to get them made so he can do anything he wants to tell his story. The result is some truly eclectic films that straddle multiple genres, I mean look at Boarding Gate which turns into an action film. Or look at Personal Shopper, film that is psychological portrait of a woman played by Kristen Stewart looking for her a sign from her recently deceased brother, but has some of the most chilling supernatural scenes ever put on film. What the “plot” of the film isn’t immediately clear. Stewart arrives at a house, experiences some weird things, talks to someone about if the house has an evil spirit in it because the house is for sale. We then follow her as she does some personal shopping for a rich woman. Eventually we come to realize that Stewart is grieving for her twin brother. He died three month earlier and is looking for a sign that there is an afterlife. I’ll not say any more other than the film jumps genres several time yet always remains a rock solid drama. Gloriously its own thing, the film in refusing to label itself, the film transcends expectations and becomes a truly satisfying experience. Beautifully acted, gorgeously shot Personal Shopper is one of the best films at NYFF. A must see. PERSONAL SHOPPER plays tomorrow (October 8) at the New York Film Festival. For tickets and more information go here.